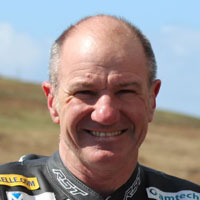 Motorcycle Legend Events is run by Andy Freeman, an Aberdeen motorcycle enthusiast, with the support of Niall Mackenzie; three times BSB Champion and former factory Grand Prix rider, with the aim of bringing the top names in motorcycle racing to Aberdeen. Due to its location, Aberdeen City hasn't previously hosted big name events, yet has a high number of motorcyclists and motorcycle clubs. I'm very fortunate to have the backing of Ecosse Motorcycles who have provided financial, logistical and practical support to the events and local businesses including The Bike Bus, The Great Western Hotel, Mal Maison, The Chester Hotel and Rig Deluge who have also generously contributed to the events. The Aberdeen City Council owned Beach Ballroom have also been very supportive of the event, allowing us to raise more money for charity than would otherwise be possible. I'm grateful to all the business, clubs and individuals (including my family and friends) who provide support and assistance. Most of all, I'm indebted to Niall Mackenzie for dedicating his time to supporting these events as both our host and our guest. Niall's knowledge of the sport and professionalism is second to none and we're very fortunate to have his commitment to our events. I look forward to running many more of these events in the future. This site is © Copyright Andy Freeman 2017. All rights reserved.